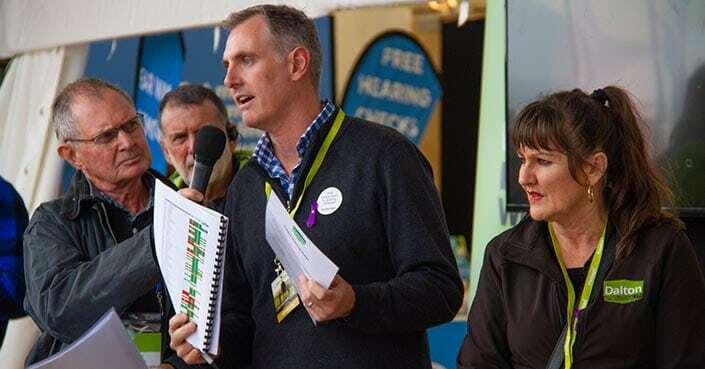 Fieldays has long offered a mix of serious business with a dose of fun entertainment for New Zealand’s farming community – something nicely epitomised by Dalton’s role at this year’s event – Fieldays 2018. 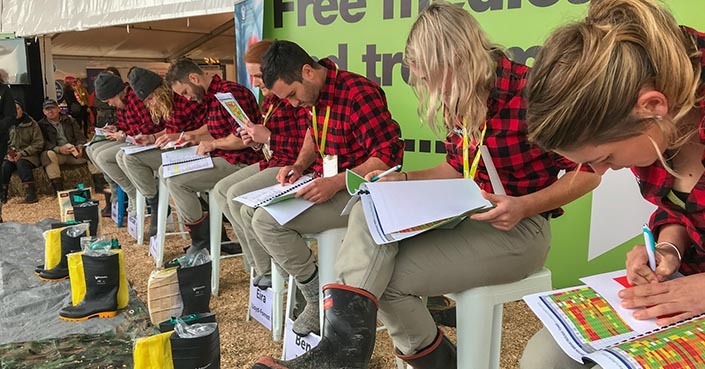 We joined the Health Hub to highlight the risks that farmers encounter when dealing with hazardous substances and came up with two interactive and amusing ways to get the message across: being part of the highly publicised and perennially popular Rural Catch competition (2018’s version of the Rural Bachelor of the Year, which now features men and women in the hunt for the Golden Gumboot) and our own “Donning Speed Test” which was part of Fieldays Health and Wellbeing’s “Clip the Ticket” contest. 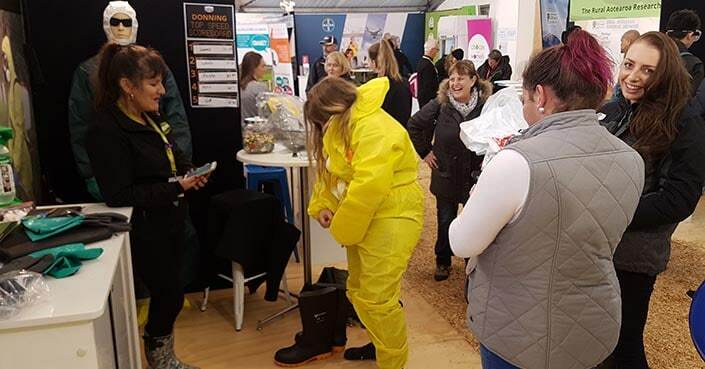 It can always be a bit of a laugh to watch people struggling to get into gloves, gumboots and coveralls as quickly as possible, but, hopefully, we were also able to get across the very serious message that those items of personal protective equipment can save their lives. Being able to demonstrate how speedily coveralls can go on might also convince a few of the more stubborn members of the farming community that safety gear is not quite the unnecessary and time-wasting encumbrance they may think it is. Including Personal Protective Equipment (PPE) in “Clip the Ticket” was important because, although many people working on farms are well-aware of the risks associated with machinery or livestock, they were perhaps less aware of the acute effects of toxic chemicals in pesticides, herbicides and fungicides. There’s now a growing body of research about long-term health effects. This includes depression, problems sleeping, mood changes and, at the worst end of the scale, cancer and neurological diseases. All of which can be likely factors in any suicide statistic. Research published last year by Dr Annette Beautrais for RHAANZ and funded by AgResearch showed that although the overall number of annual farm-related suicides seemed to be decreasing between 2007 and 2016, the young made up a high proportion of those figures. Considering all 185 farm suicides, 12% were aged less than 20 years, one third (32%) less than 30 years, and almost half (47.5%) were less than 40. The “Clip the Ticket” contest was deliberately targeted at the younger generation of farmers aged 18 to 30 and had been organised by Rural Health Alliance Aotearoa New Zealand to focus on the fact that about half of the people committing suicide on farms were under 40. The “Clip the Ticket” competition was a bit of fun for the 35 people a day we saw take part on each of the four days, and more than a little competitive. Just ask our managing director, Darryl Burn, who saw his first effort of 44 seconds eclipsed by a number of entrants! He had to have a second go to improve to 23 seconds! It also gave us the chance to start some significant conversations with hundreds of visitors about the practical effects of good health and safety, and the importance of mental well-being. For example, we heard some incredible stories from farmers who had been exposed to hazardous substances and suffered dramatic health effects. One instance was related to us by a farmer who had been forced off work for more than two years as a result of poisoning, and yet another by an organic kiwi fruit grower who knew of two neighbouring farmers who used traditional pesticides, succumbing to lymphoma. We were also delighted to be included in the Rural Catch contest because it showed health and wellbeing to be one of the key components in finding the ideal farmer, alongside the more traditional pursuits of dog handling, fencing, quad bikes and fitness. As well as the practical speed test where the eight contestants had to don coveralls, boots, gloves, safety glasses and a half-face respirator with gas and clip-on filters, there was also a theory test where they had to match the right gloves, coveralls and mask filters to a specific hazardous chemical. The two winners in our category were New Plymouth dairy farmers Berny Hall and Ben Fisher, who narrowly missed out on the overall Golden Gumboot award after coming runner-up to Taihape shepherd Mairi Whittle. 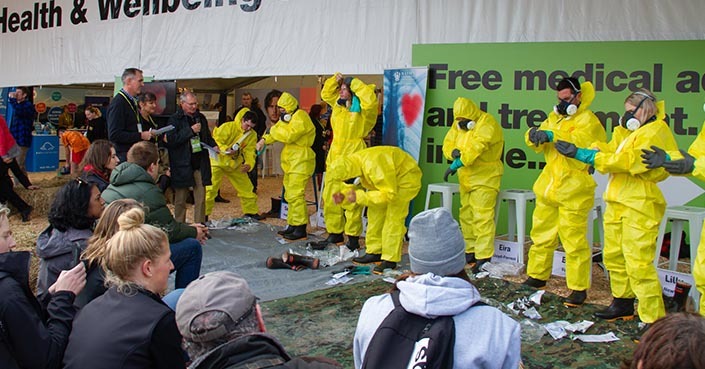 Darryl Burn said the chance to get involved in some of Fieldays’ lighter moments had been the perfect way to convey a critical message about the importance of safety solutions for agricultural workers handling hazardous substances. 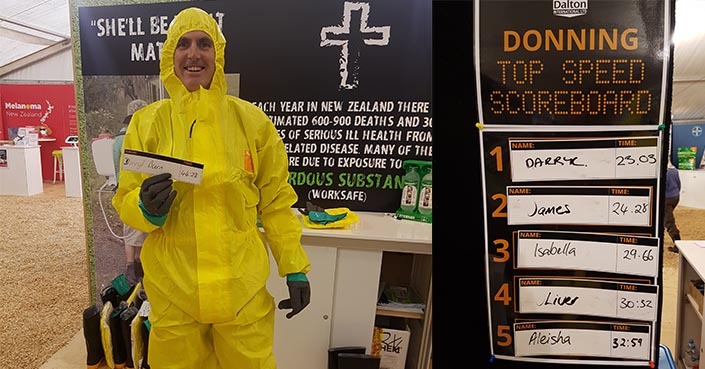 “A lot of recent research into long-term effects of some agrichemicals has been quite a wake-up call for Kiwi farmers so it’s important to get the message out there that using the right safety equipment and clothing is vital for their health not just now, but long into the future,” he said. 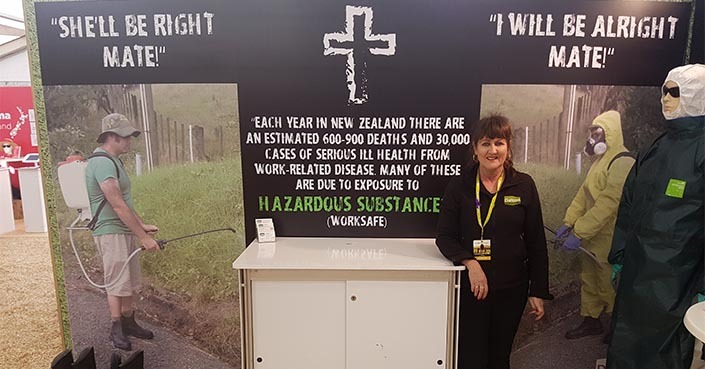 For more information on how we can work alongside your farm or business to ensure you and your workers are protected against hazards, contact Dalton International on 0800 323 223, enquiries@dilnz.co.nz or via the website.